The digibooster3.library is the official DigiBooster 3 replayer in a form of Amiga shared library. It is available for AmigaOS 3, AmigaOS 4 and MorphOS. The library comes with developer documentation, examples and source code, licensed on BSD licence. Using the library is recommended over the static libdigibooster3, as it produces smaller executables, also users can have the latest version of the replayer without recompilation of applications. DigiBooster 3.1 was released for AmigaOS 3, AmigaOS 4 and MorphOS. DigiBooster 3.1 is available on CD-ROM and as download in our online-shop http://www.amigashop.org. DigiBooster 3.1 follows the traditional tracker's way of making music with an advanced audio processing engine, and an up-to-date MUI based graphical user interface. It retains backward compatibility with its Amiga ancestor, DigiBooster Pro 2. On the other hand the program code has been written from scratch. Its modular design gives it a straightforward path for future development. Except for versions for classic Amiga computers, DigiBooster 3.1 is also compiled for PowerPC processors, taking advantage of their greater computing power. ProTracker modules import. DigiBooster 3.1 can load and play basic four track modules, as well as multichannel ones, up to 32 channels. Import quality is significantly better than in DigiBooster Pro 2.x. Autosaving. DigiBooster 3.1 can save in user defined periods of time and keep defined number of lately saved versions with autorotation. Finished block operations in the pattern editor. DigiBooster 3 supports multitrack blocks. Block operations are also available in the ARexx interface. ARexx commands for loading/importing the module and starting playback. New languages: French and Polish. How to get an update to version 3.1 ? The update from version 3.0 to 3.1 is available for free! Updates from older releases (DBPro 2.x) are not possible! Users who bought the download version before just have to login at our online-shop and simply download the current full version archive of DigiBooster 3.1. You will get your update immediately via eMail. Minimum: 68020, Harddrive, 8 MByte Fast-RAM, Workbench 3.0, MUI 3.8, AHI 4.x, screenmode 640x480. Recommended: AmigaOS 3.x, 68060/50 MHz, 16 MByte Fast-RAM, graphics card, soundcard. Supports: WinUAE (JIT enabled) with Picasso96 and dedicated AHI drivers. Minimum: AmigaOS 4.0, Harddrive, 128 MByte RAM, MUI 3.9. Recommended: AHI compatible soundcard, +500 MHz processor. Minimum: MorphOS 2.7, Harddrive, 128 MByte RAM. Recommended: AHI compatible soundcard, +500 MHz processor. libdigibooster3 is a decoder for Reggae, MorphOS multimedia framework. The decoder class, named "digibooster3.demuxer" enables all audio players using Reggae (including system default player Jukebox, shell command Play, as well as yet to be released virtual DJ console SoundBankster) to play DigiBooster 3 and DigiBooster Pro 2 modules directly, without a need of pre-rendering them to an audio file. Joining in the celebration of the highly anticipated release of DigiBooster 3, Airsoft Softwair is proud to present a DigiBooster plugin for Hollywood. After installing this plugin Hollywood will "automagically" be able to play DigiBooster modules in 44.1khz 16-bit stereo for your ultimate Amiga tracker experience. DigiBooster 3 is available on CD-ROM and as download in our Online-shop http://www.amigashop.org. DigiBooster 3 follows the traditional tracker's way of making music with an advanced audio processing engine, and an up-to-date MUI based graphical user interface. It retains backward compatibility with its Amiga ancestor, DigiBooster Pro 2. On the other hand the program code has been written from scratch. Its modular design gives it a straightforward path for future development. Except for versions for classic Amiga computers, DigiBooster 3 is also compiled for PowerPC processors, taking advantage of their greater computing power. High quality audio engine, 24 bits, up to 192 kHz. Backward compatiblity with DigiBooster Pro 2.x. MUI based interface, dynamically adapts itself to the screen size. Opensourced replayer code, portable also for non-Amiga systems. All sound effects are executed in single step mode. Single step auto-synchronisation to the module tempo. ARexx port offering full control of the program from scripts. Minimum: 68020, Harddrive, 8 MB Fast RAM, Workbench 3.0, MUI 3.8, AHI 4, 640 x 480 screenmode. Recommended: AmigaOS 3.x, 68060/50, Harddrive, 16 MB Fast RAM, graphics card, soundcard. The beta version 26 of DigiBooster 3 for 68k Amiga, AmigaOS 4 and MorphOS was published online. Since it is probably one of the last beta versions before the final release, we invite every user to test and report the version as detailed as possible and write all bug reports directly to the DigiBooster support forum. DSP echo engine, already demonstrated in DigiRoller. The echo is fully compatible with DigiBooster 2.x, but this time it does not depend on AHI settings, so it is always processed. Additionally new effects 'V20' and 'V21' allow for independent echo parameters for each single track. Phase augmented stereo panorama. This has been demonstrated in DigiRoller as well. Small phase shifts added when setting stereo panorama improve sound positioning and overall sound space experience. New envelope editor. Unlike DigiBooster 2.x, it is embedded in the main window, so it is much larger and shows both volume and panning envelopes on one diagram, so it is easier to design combined effects. Diagram width is adjustable, so editing short envelopes is now easier. Mixer (module renderer). AHI independent, allows for mixing frequencies from 8 kHz to 192 kHz. Full 24-bit output available, writes WAVE or AIFF files. Volume boost up to 48 dB (with hard limiter) with optional autoboost calculation. Works in the background on separate process. 24 more fully documented ARexx commands. Since today DigiBoosterPro 2.21 is available in the online shop of APC&TCP at a discounted price. DigiBooster 3 is a music tracker. Its history has roots in ancient times of Amiga. Amiga was the first popular computer having stereo PCM audio output. Then it had a potential to be used as a device for making music. This potential has been fully exploited. The Ultimate Soundtracker was the first in 1987. 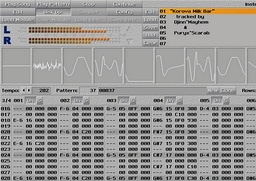 NoiseTracker was the second in 1989. ProTracker had beat'em up in 1991. Amiga was getting faster processors. Multichannel software mixing was a logical step forward. Tomasz and Waldemar Piasta have done this step in 1998 creating DigiBooster Pro 2. It has been later bought by APC&TCP. AHI unit configurable via commandline parameter and icon tooltype. Current song position displayed also as text. Filename for output file is generated automatically from module name. Playback mode is set as default now. Spanish catalog and guide translation by Dámaso Domínguez. Polish guide translation by Grzegorz Kraszewski. Fixed crash when MUI is not installed. Basic sample editor with format conversion (can load and save AIFF, WAVE, 8SVX and 16SV formats), cut, copy and paste including system clipboard, realtime loop editor. ARexx port with 22 fully documented commands. Improved player engine, better backward compatibility with DigiBooster Pro 2.x. Unique feature of single step (and step back) playback with all effects and autosynchronization. More documentation, extensive descriptions of DigiBooster effects. Many small improvements listed in the changelog. The released beta is a demo version. The only limitation of demo is disabled module saving.